Masonic Artwork, even though it has much more meaning than just a piece of decoration, is used by many lodges to decorate or dress up the lodge and Its social areas, and the same Masonic Artwork is also used to decorate many Masons' homes. 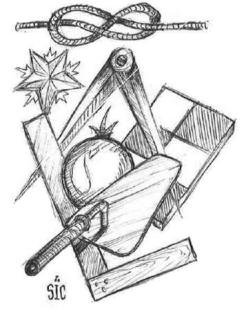 Each piece of Masonic artwork portrays a story about Freemasonry by illustration. The saying, a picture is worth a thousand words, is more true to a Mason when looking at Masonic Art than to a non-Mason with any other type of art. Every piece of Masonic Art depicts something unique related to the history of Freemasonry. Almost any Mason can verify this. Many Masonic groups who have formed to support Masonic charities, causes and other functions are in need of good clean, crisp and clear artwork in their logo to identify them and set them apart in a large field of different Masonic Groups. A well designed logo will set a group strides ahead of those who use a logo that is made without an artful design. magazine article. Our apologies to Bro Chrisopher. This month, the Widows Sons Magazine is featuring the artwork of Brother Christopher Sicurella, of Germany. The artwork Brother Christopher can do for you or your lodge or group is described in the feature article in this section of the WSMag. We hope you enjoy his artwork, and if you are in need of any type of artwork, Brother Christopher will make your thoughts and desires into a work of art, sculpture or a logo. You can contact Brother Christopher by e-mail from his website which has been added to the feature article. We will be also displaying Brother Christopher's artwork in the January and February issues of the WSMag.